The 7th May 2013 marks ‘world asthma day’. Helping to raise awareness of this often debilitating condition of the lungs. I have had asthma since about the age of 4 and spent a lot of time off school in my early years. Thankfully my asthma is managed really well and it no longer has a negative impact on my life. If you head on over to http://worldasthmaday.org/ you can find a wealth of information on asthma and is Dedication to Asthma Prevention, Diagnosis and Treatment. This particular important event happens every year and is run by the Global Initiative for Asthma, and it aims to help bring asthma awareness to the public across the globe. There are approximately 300 million asthma sufferers in the world and is the most common chronic illness found in children. The World Health Organisation is keen to make people aware that asthma is a global problem but in countries where there is a lower income, death rates are inevitably higher. Asthma can be a chronic condition that affects the bronchial tubes of the lungs. The inflammation found in these little tubes can cause the passage of air to be restricted and the sufferer experiences breathlessness and wheezing. When the lungs cannot oxygenate the blood properly, it can make the individual feel really bad. Often, because of this lack of air, the person may start to feel stressed or even begin to panic and this makes the asthma worse. The suffere will more than likely experience coughing, breathlessness, pain in the ribs and around the chest. An asthma attack can happen at any time and mine seemed to be worse after physical exertion, such as running. During this activity my bronchial tubes would inflame and this would limit the airflow into the lungs. If you imagine trying to breathe through a dry sponge, it is relatively easy, however, if you wet that sponge and tried to breathe through it, you would get some idea of the restrictive airflow. It isn’t fully understood what causes asthma, it appears to run in families and seems to be triggered also, by particulates in the air such as, dust, pet hair, smoke, fog or mist, feathers and particles from spray cans like air fresheners. Certain medications may also make asthma worse, such as aspirin. Asthma is generally treated using inhalers containing certain medications. 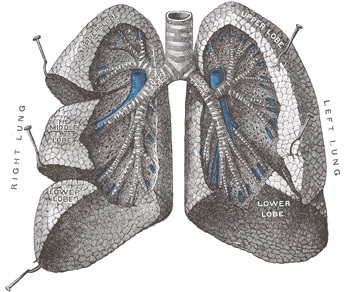 These medications help prevent the inflammation in the lungs, opening up the airways. Usually a person will have a preventative inhaler that they take for the long term and another inhaler that they use as and when the symptoms occur. Unfortunately, there isn’t a cure yet for asthma, which is why it is important to support the research into asthma, take a look at the ‘world asthma foundation‘ website for much more information and how they support and inform asthma sufferers, their families and the general public.